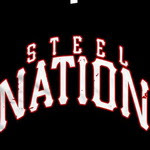 "Ok, I am sick of having shirts sit around my apartment," - Steel Nation got all their merch on sale in their bigcartel store. Just click here if you're interested. In the other news, the band is working on new material and, according to their Facebook page, should 'record again soon'.